Totem Lake Actually Exists – Who Knew? 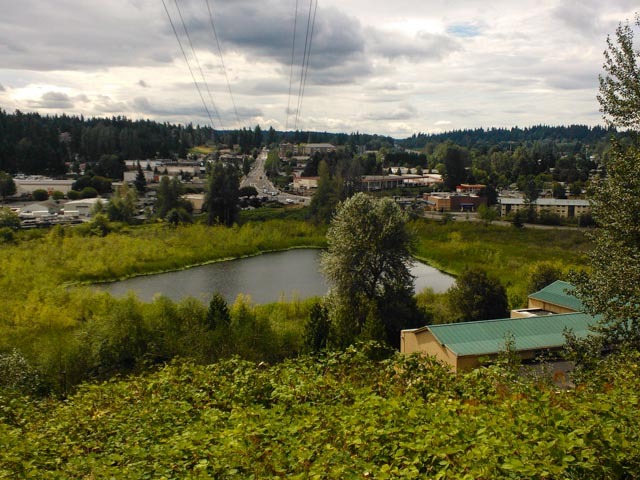 While out riding around Kirkland with City Council member Shelley Kloba she had us looking at this view, and I wasn’t sure why. Turns out we’re a little further away from the pond than I thought and that it’s actually Totem Lake. I did not know this lake actually existed – it’s kinda cool that it does. The hospital and the mall are off to the right in this picture. In the map below the view is from where I put the little yellow number 1. The ride was great. We got to see a lot of the bicycle infrastructure that exists in Kirkland, and places where it could be better done. Eastbound on 132nd, for example – you lose the bike lane right when you need it going uphill. Tracking stuff like this can make a city work a lot better for its residents and the folks that work there. Getting the cross-Kirkland connections right in a very hilly city is pretty critical and I’m pleased Shelley is working on it so diligently.